3/3/2016Share this story on Facebook! Heath, Owens, and Heatley use humor to engage the audience in deeper topics of race, class, and lifestyle divides. Photo by Harlem KW Project. "IC gave me the tools to build the career of my dreams and the opportunity to expand my education through my own creativity," Jaylene says. While Jaylene was a student at IC, she founded Spit That!, a spoken-word poetry group celebrating its 10-year anniversary in 2016. Jaylene tells her post-graduation story, from Ithaca to off-Broadway. It all started with a Facebook status and a metaphor about a killer whale. Jaylene Clark Owens ’10, an actress and spoken-word poet, wrote about entering the art world post-graduation on social media, comparing an expanding white presence that is slowly pushing out black voices to the coloration of the underside of a killer whale. The metaphor caught the eye of Alfred Preisser at the Harlem School of the Arts, and he asked her to expand upon it by writing a play that incorporated spoken-word poetry. The result was Owens’ “Renaissance in the Belly of a Killer Whale,” which she performed alongside actresses Hollis Heath and Janelle Heatley in February as part of the Center for the Study of Culture, Race, and Ethnicity’s Discussion Series. The lights came up in Klingenstein Lounge in Campus Center, and Owens sat on the stage, wearing jeans and a T-shirt and holding a brown paper bag. The setup is deliberately simple; the performance gets its strength from its powerful script. Owens calls it a “poetrical”—a portmanteau of poetry and musical—that transforms the three actresses into a Greek chorus of Harlemites telling the past, present, and future of their home village. They create the neighborhood’s scenery through song, dance, clapping games, and spoken-word poetry. The women’s words paint the nostalgia and memories of how Harlem used to be, and even audience members who didn’t grow up between W. 110th and W. 155th Streets can resonate with feeling disconnected from home. “I wonder if I could purchase forget-me-nots and send them back to Harlem’s childhood,” Owens says. 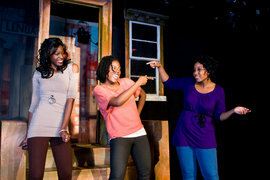 The women also demonstrate the painful, confusing, and angering effects of gentrification on Harlem’s natives. As the characters struggle to come to terms with the changing scenery of Harlem, they stress the importance of remembering its roots. They call for a movement to revamp the neighborhood’s traditions and promote black art, values, and leaders. And the final poem leaves the audience with a promise.